Each printer driver has a minimum margin size defined which is enforced regardless of what you enter into this dialog box. 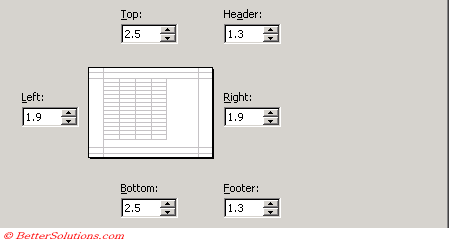 Margins determine the amount of space between your data and the edge of the paper. Default margins are: left: 0.75, right 0.75, top: 1 and bottom: 1. All margin measurements are in inches. Adjusting the margins can be an effective way to fitting slightly more on a page. This allows you to determine the amount of space between the edge of the paper and your data. The Preview box will give a good indication as to how the page will look when it is printed. Top - The distance from the top of the paper to the start of the data. Header - The height of the header. Left - The distance from the left side of the data to the edge of the paper. Right - The distance from the right side of the data to the edge of the paper. Footer - The height of the footer. Bottom - The distance from the end of the data to the bottom of the paper. If you are using the headers and footers then make sure your top and bottom margins are larger than your header and footer margins. You can alternatively change the margins by dragging them visually in the Print Preview window. You can change the location of your headers and footers by using the "Margins" tab, and adjusting the "From Edge" value. Changing all the margins to zero is very confusing and does not mean that there are no margins. The smallest margins are: left 0.6, right 0.6, header 0.6, footer 0.6, bottom 0.6. Horizontal - Centres your data horizontally on the paper. Vertical - Centres your data vertically on the paper. All margin measurements entered on this dialog box are in inches.